Requires a 3/4 ton truck or bigger to tow. Deck Height (in) unloaded 25"
Std. 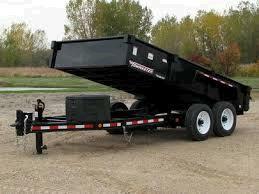 Hitch Size (in) 2-5/16"
* Please call us for any questions on our dump 6 foot x12 foot trailer 12 000 rentals in Toledo OH and Perrysburg OH, serving the Toledo metro area.